On the plus side, this didn't get penalised. Boy did he go for the full spill. Yep that was great. Glad they didn't call it a penalty. Neither of them was going for the puck McGinn obviously out head-hunting and forgot who he was up against. 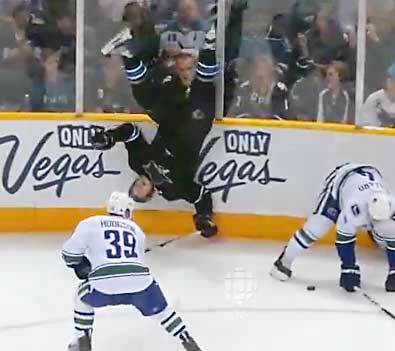 Ballard has the best hip-check in hockey, Hamhuis' ain't bad either. Was so happy to see Ballard draw back into the lineup for that hit alone! I see what you are all saying about the penalties ruining the flow to the game but honestly, I don't see what options the refs had. I've never seen something like that happen but they were all clear penalties. Of the four, I suppose you could argue the Mitchell penalty but he was pretty blatant in hooking Sedin down. I am generally not a fan of so many penalty calls but the Sharks have only themselves to blame. The two early penalties were lazy/careless plays by the Sharks and the too many men and delay of game calls? Pretty lousy way to lose a game but you have to be more careful than that. That Hamhuis call was bogus...totally embelished. Dan barely touched him. I really hope Ballard can keep his position....guys will be tentative knowing he's on the ice...he's a superb hitter, and a bit high risk but such a solid skater and slick passer I think the pros outweigh the cons. With Rome you get very basic play but even then he has his defensive lapses and is not a strong skater. With Keith in our lineup our top 6 is sick! I was in San Jose for game 4. Seeing over 6000 fans join our small contingent of 4 was amazing. I was expecting about 1000 fans to show up but it was unreal. An SJ cop who works every Sharks game told Mr. LB and I, he's never seen any other opposing team bring this many people and pretty much take over their bars, their street, and their arena the way the Canucks fans did. O Canada was loud and proud, we chanted "Go Canucks go!" " Ole ole ole ole.." as much as we could throughout the whole game. I can't wait to find out where I am going to watch the road games for the cup final, once the Canucks finish this series off. I usually won't share these but, because it's round 3 and we're a small group of posters, I did. LB, that's amazing! It's one thing during the regular season but I'm surprised that you were all able to get tickets. I thought San Jose was actually a very good hockey market. Well done supporting the team abroad. Must have been a hell of a trip and glad to see they were able to at least take one game from the set! rockalt wrote: LB, that's amazing! It's one thing during the regular season but I'm surprised that you were all able to get tickets. I thought San Jose was actually a very good hockey market. SJ is a good hockey town, but yeah we got tickets the minute they went on sale via ticketmaster for Game 3 and then Game 4 we went through Stubhub. We had an amazing time, and now it's time to hit either TB or Boston. We'll know shortly!